Dental sealants protect your teeth from harmful tooth decay. Your sealants are tooth-colored and form a protective layer over the surfaces and deep grooves of your teeth where your risk of decay is highest. Dental sealants cover and protect the chewing surfaces of your teeth. Tooth damage can result from the food particles and acids. Your sealants provide long-term protection for your teeth. They can last for 10 years or longer in many instances. Sealants are also a cost effective way to prevent the need for more costly dental treatment over time. Children and adults can benefit from dental sealants. Your sealants can be applied in minutes during one in-office appointment. On occasion, you can have the procedure during another scheduled treatment. The treatment is non-invasive. It requires no anesthesia or removal of your tooth structure. 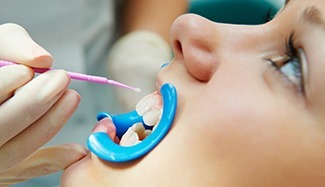 The sealant material will be applied to your cleaned, dry tooth surfaces. Once they bond to your teeth they will be rinsed, dried, and cured with a special curing light. Contact your Palm Beach Gardens dentist, Dr. Alvarez, about dental sealants. Schedule your treatment during your next dental exam and teeth cleaning. We at Natural Smiles of the Palm Beach use dental sealants when necessary to prevent tooth decay.